Event dates are April 11 and 12, 2019 only. Theme park will remain open until 11pm for this separately ticketed event. Exclusive event entertainment begins at 6pm and ends at 11pm. Guests can enter the Park starting at 4pm to enjoy all available attractions. The Wizarding World of Harry Potter™ attractions, food and retail venues will be open during the event. Event dates are April 11 and 12, 2019 only. Ticket valid on selected date of purchase only. Theme park will remain open until 11pm. Guests can come in as early as Park opening and stay through the event. Check UniversalStudiosHollywood.com for Park hours. Exclusive event entertainment begins at 6pm and ends at 11pm. The Wizarding World of Harry Potter™ attractions, food and retail venues will be open during the event. Click HERE to Purchase Tickets as they will Sell Out! Universal Studios Hollywood rolls out the red carpet for the “Dark Arts at Hogwarts™ Castle Premiere Event,” a special experience that offers fans a first look at the new light projection show at “The Wizarding World of Harry PotterTM” on Thursday, April 11 and Friday, April 12, 2019. The event’s main attraction is an exclusive first-look at the all-new “Dark Arts at Hogwarts Castle” projection display that brings to light an exciting new dimension of sorcery within “The Wizarding World of Harry Potter.” A mesmerizing pageantry of light, music and special effects will unleash the darkest creatures and villains from the Wizarding World, including the powerful Dark wizard Lord Voldemort. Guests will be challenged to summon their inner strength and bravery in the face of the all-consuming Dark Arts as some of the awe-inspiring moments and creatures inspired by the films come to life within the majestic light display accompanied by an atmospheric musical score created by John Williams. Additionally, guests will be treated to a premium catered feast of foods, beverages and desserts as part of this exclusive opportunity. A new wand will also debut in conjunction with the exclusive event, offering fans a chance to purchase this limited edition memorabilia and add to their wand collection. Event tickets are on sale now, which includes early entry to Universal Studios Hollywood, and are available to purchase here. Advance purchase is recommended as limited tickets are available, and event nights will sell out. 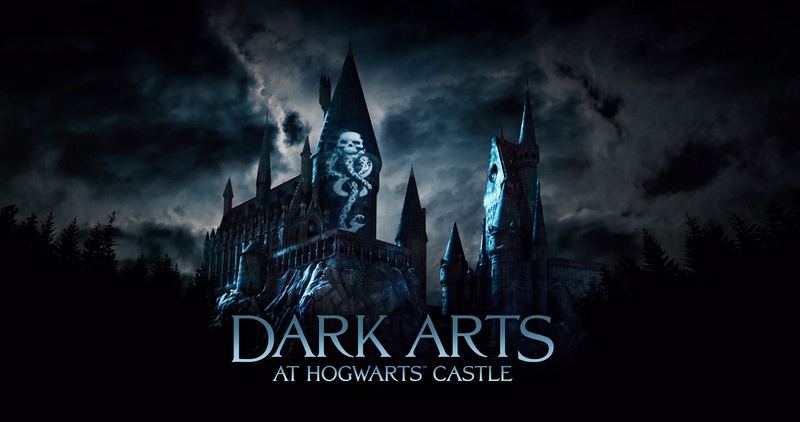 “Dark Arts at Hogwarts Castle” opens to the public on Saturday, April 13 and will continue through Sunday, April 28, 2019 at Universal Studios Hollywood. Next week, Universal Orlando Resort will reveal new details about Hagrid’s Magical Creatures Motorbike Adventure – the all-new, highly-anticipated coaster experience opening in The Wizarding World of Harry Potter – Hogsmeade on June 13. Visit UniversalOrlando.com at 8:30 a.m. EST on March 12 to hear the special announcement from Tom Felton and Alan Gilmore, Art Director of the Harry Potter films and The Wizarding World of Harry Potter! The Dark Arts are Coming to Universal Orlando Resort & Universal Studios Hollywood! Death Eaters and Knockturn Alley lovers, rejoice! A powerful dark arts spell has been cast on The Wizarding World of Harry Potter, bringing a dynamic, all-new light projection experience to Universal Studios Hollywood and Universal Orlando Resort! The “Dark Arts at Hogwarts Castle” will illuminate Hogwarts castle at Universal Studios Hollywood nightly from April 13 – 28 and May 25 – 27. Universal Orlando Resort’s will debut the Dark Arts at Hogwarts Castle later this year with dates to be announced. We will keep you updated on any new developments for Orlando’s dates. Universal Studios Hollywood and Universal Orlando Resort invite guests to experience an exciting new dimension of sorcery at “The Wizarding World of Harry PotterTM” with the introduction of the “Dark Arts at Hogwarts Castle,” a powerful, original and breathtaking projection experience. As darkness falls on Hogwarts castle, Dementors™, Death Eaters and other unspeakable creatures from Aragog and Mountain Trolls to Thestrals will cloak the castle with sinister images from the darker side of magic—even conjuring the visage of Lord Voldemort™ himself, until the Patronus spell—one of the most famous, difficult and powerful defense of the Dark Arts charms in the wizarding world—is cast. Inspired by J.K. Rowling’s compelling stories and characters that were brought to life in the Warner Bros. films, “The Wizarding World of Harry Potter” at Universal Studios Hollywood and Universal Orlando Resort is a masterful recreation, faithful to the visual landscape of the fiction and films, including as its iconic focal point, Hogwarts castle. From its snow-capped roofs and cobblestone streets to the historic British sensibilities that characterize the whimsical look and feel of the land, “The Wizarding World of Harry Potter” transports guests of all ages to the very places they watched on the silver screen. With so much to see and do at Universal Studios Hollywood, the all-new 2019 Season Pass invites guests to experience the fun throughout the year for $149 when purchased online. Blackout dates and restrictions apply. Visit www.UniversalStudiosHollywood.com for more details. At Universal Orlando, guests can take advantage of an unprecedented offer featuring up to six months free on any Universal Orlando Annual Pass if purchased before April 4, 2019. Click here for more details about Annual and Seasonal Pass options. In a quick new video released on Facebook, Draco Malfoy actor Tom Felton and Art Director of the Harry Potter films and theme parks Alan Gilmore introduce the new attraction opening this Summer at Universal Orlando Resort! Hagrid’s Magical Creatures Motorbike Adventure will open to the public on June 13, 2019! Universal Orlando Resort has announced the opening date for their new Harry Potter themed roller coaster! On June 13, 2019 Hagrid’s Magical Creatures Motorbike Adventure will open to the public! For the first time ever, join Hagrid™ as you fly far beyond the grounds of Hogwarts™ castle on a thrilling roller coaster ride that plunges into the paths of some of the wizarding world’s rarest magical creatures. This ride is replacing a previous fan favorite ride – Dragon Challenge, which was two separate coasters on different tracks. Not much is known about this new ride, but we can only imagine it will be even better than its predecessor! Many fans will recall that last September, Universal Orlando Resort closed down the Dragon Challenge roller coaster in the Wizarding World of Harry Potter – Hogsmeade to make room for a new Potter-themed ride. Today we get our first look at that new attraction in the form of a poster! Set to open in 2019, this new roller coaster seems to be themed for The Forbidden Forest with a few Cornish Pixies wreaking havoc on the poster. No details on the ride have been announced but we will report as more information becomes available. Universal Orlando Resort is giving guests a glimpse of the environment it is creating for the highly anticipated new experience coming to The Wizarding World of Harry Potter – Hogsmeade in 2019. Today, the resort shared never-before-seen artwork hinting at the magical adventure that awaits. In 2010, Universal Orlando Resort brought the wonder, excitement and adventure of the Harry Potter books and films to life for the first time with the opening of The Wizarding World of Harry Potter – Hogsmeade at Universal’s Islands of Adventure. The expansion of the global phenomenon continued in 2014 with the launch of The Wizarding World of Harry Potter – Diagon Alley at Universal Studios Florida – allowing guests to experience even more extraordinary moments from Harry Potter’s magical world. With the Hogwarts Express connecting both lands, providing guests the opportunity to board the iconic train and relive Harry’s unforgettable journey, Universal Orlando created the world’s first centrally-themed, [sic] multi-park experience. 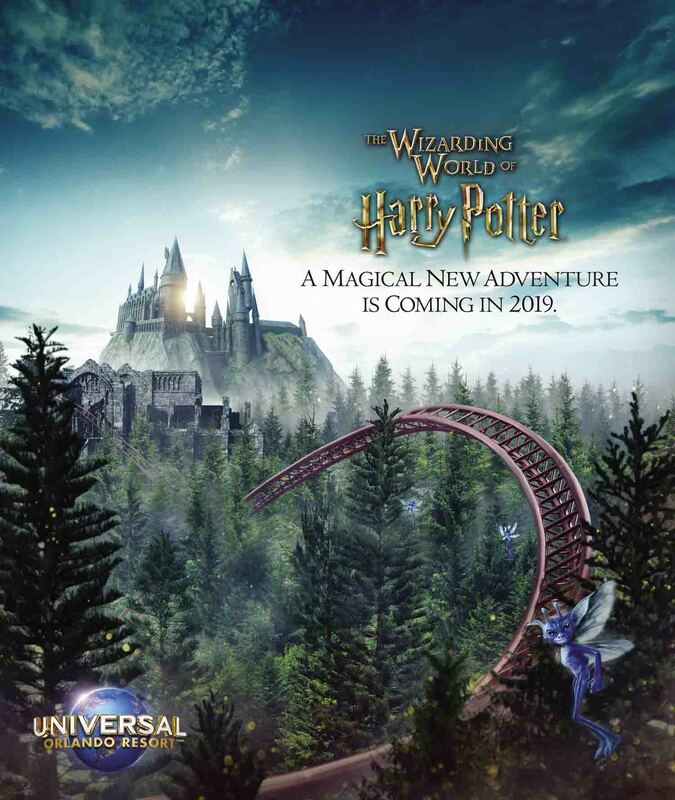 Opening in 2019 at Universal’s Islands of Adventure theme park, the new experience will become Universal’s most highly-themed coaster yet – immersing guests in an all-new adventure that is the next installment of the Wizarding World brought to life at Universal Orlando Resort. More information about the attraction will be revealed in early 2019. Stay tuned for an exact date and more information.